Negotiations can be held up unnecessarily by focusing on minor differences, creating a misalignment that hinders shared beliefs and values. 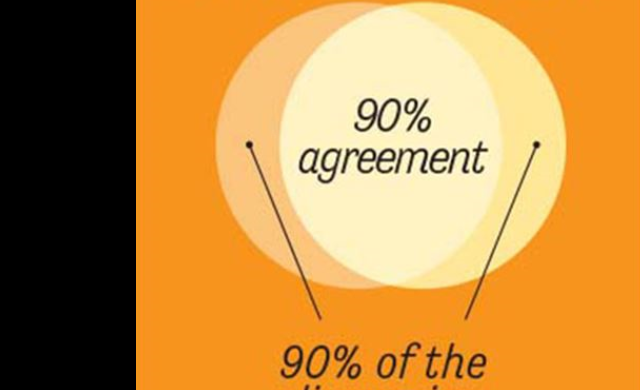 This is what we learned from the #procurement community, when @bmaltaverne shared @lripsher’s 90% rule. “We spend 90% of our time talking about the 10% of things we disagree on,” says Lawrence Ripsher, a Seattle-based software builder. “I can recall many examples when I’ve had a conversation, meeting or discussion with someone (who I generally agree with) turn into a fully fledged debate.” All the energy goes into arguing the minor differences, rather than building on shared beliefs. Actively look for areas where there is 90% agreement and spend time on those, he advises. As disagreements emerge, articulate the points and move on – if a decision needs agreement, ask is there enough of a shared view to make this happen. Loop back at the end and work on disagreement then. “Good stuff, applicable to negotiations in procurement,” tweeted Bertrand Maltaverne, procurement digitalist.